For problematic skin, prone to acne. This concentrate suppresses fat secretion and inflammation and prevents the formation of blackheads and pimples. This bioactive formula includes tea tree oil, sumac and propolis which also suppress bacterial infections with a cleansing, antiseptic and antimicrobial action. The concentrate of rose extract with natural, cold pressed oils effectively restores elasticity and energises the skin. This natural source of vitamins A, C, and E maintains optimal, healthy skin, smoothes existing wrinkles and prevents new wrinkles developing. It also invigorates and stimulates cell regeneration and counteracts the ageing process. Q10 coenzyme penetrates the cell membrane and assists the regenerating ability of the epithelium, smooth wrinkles, improves elasticity and regulates the hydration of the epithelium. Formulated with pure Bulgarian rosewater and rose oil, our face wash offers effective daily cleansing, while protecting the skin’s natural oil balance, keeping it hydrated and nourished. Its natural antiseptic, anti-inflammatory properties soothes and cools sensitive and irritated skin. These luxurious natural ingredients that are rich in antioxidants, key vitamins and moisturising properties help refine texture, restore elasticity, leaving skin energised, smooth and with a beautiful glow. Also stimulates blood circulation and cell regeneration to counteract the ageing process. 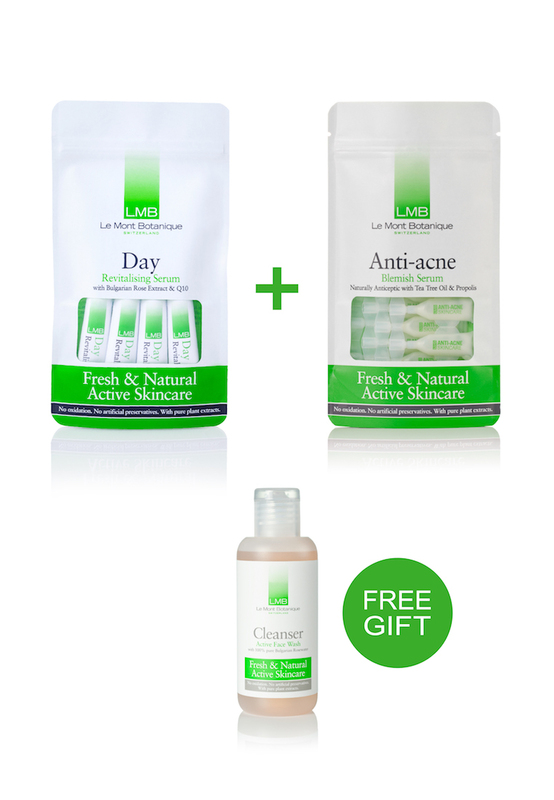 After cleansing with LMB's Active Cleanser, apply the Anti-Acne serum to problematic areas of the skin only, in the morning and at night. Use LMB's Day serum on the rest of face and neck. Shake well, twist cap off ampoule/tube and apply a sufficient amount of the serum onto the skin. If all contents are not used, replace the cap of the ampoule/tube, refrigerate to keep for 5 to 14 days.